Welcome to part five of this series exploring every single film stock (including instant film, dry plates, etc. ), still being made today. Combining parts one, two, three and four, this series has covered 114 film stocks so far. Adding O to R gives us another 36, bringing our running total to 150 with one final listing article to go before the epilogue arrives with a complete reduced-detail listing on a single page. As with the other parts in this series, any uncredited sample images below are my own and exist in one form or another as Daily Photos, or part of articles written by yours truly for this website. Every other image has been credited to the photographer that created it. Product images were obtained from specific vendor websites/materials. Oriental Photo Industrial was founded in 1919 offering the first line of photographic photosensitive materials made in Japan. The company first started producing plates in 1928, moving to 120 roll film in 1934 and their first color negative film in 1953. International exports began in 1921, and their products gained a large international following. Of note, Ansel Adams is said to have sworn himself to use only Oriental paper. 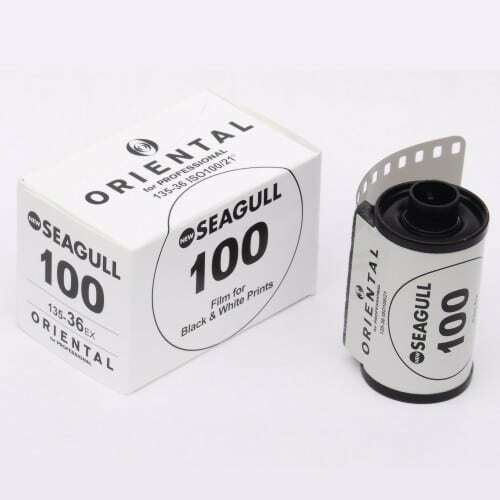 Oriental still product photographic papers today – New Seagull and Hyper Seagull and in 2016 announced their return to film products in the form of Oriental New Seagull 100 and 400 in 35mm format, exclusively for the Japanese Market. New Seagull 100 was made available in Japan only in single, 3, and 10-roll packs on February 24th, 2016. It is a 35mm orthopanchromatic ISO 100/21° black and white film and is available in 36 exposure, DX-coded cartridges. 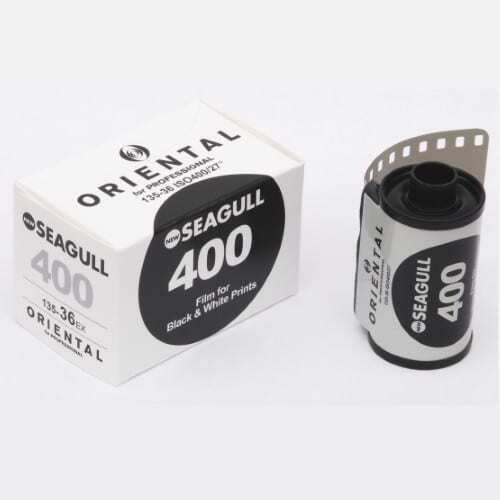 Like its ISO 100 sibling, Oriental Seagull 400 was created exclusively for the Japanese market by a third party vendor. It is a 35mm ortho panchromatic ISO 400/27° black and white film and is available in 36 exposure, DX-coded cartridges in 1, 3 and 10-roll packs. Shot on Oriental New Seagull 400 at EI 400. Oriental New Seagull 400 shot at EI 400. Founded in Wolfen, Germany, ORWO started off as the Agfa Wolfen plant (where the first mode colour film using incorporated dye couplers was developed) in 1936. The name is derived from “ORiginal WOlfen”. At the end of World War II, the Wolfen plant was taken over by US forces and eventually fell behind the Iron Curtain and much of the plant was dismantled and moved to the Soviet Union, where it formed the basis for the Soviet color film industry. The company was eventually liquidated following the fall of the Berlin Wall in 1990 and revived in 1998 by FilmoTec GmbH. The company continues to produce film stocks today, specialising in products for the motion picture industry. ORWO DN21 (Duplicating Negative) is a low-speed, high sharpness, black and white motion picture film, specifically designed for the production of black & white duplicate negatives from master positives, or internegatives from reversal negatives. DN21 is a panchromatic film and coated on a clear polyester base. The film is available in 100ft and 2000ft reels. ORWO DP31 (Duplicating Positive) is a modern positive duplication film used for making master positives from black and white negatives. It is a panchromatic ISO 3/6° film with excellent resolving power and renders well-balanced grey tones. The film is available in 100ft and bulk-loaded 35mm (non-DX coded) cartridges. ORWO N74 plus is an ISO 400/27° black and white panchromatic film for both outdoor and indoor use. Its wide exposure latitude makes it especially suitable for use under low light illumination and difficult lighting conditions. The film is available in 16mm and 35mm formats, is coated on a triacetate base and was previously also available as Bergger BRF400. ORWO PF2 (Positive Film) is used for the production of high-grade black and white prints. It has an extremely fine grain, excellent resolving power and produces well-balanced grey values, especially when used in conjunction with ORWO Negative and ORWO Duplicating films. The film is available in 16mm (single and double perf), 2000ft 35mm reels and 100ft 35mm reels. The ORWO TF 12d (Tone Negative) is an orthochromatic black and white negative film for recording soundtracks. The film provides both anti-static and ant-halation layers, which are dispersed during development. The film is coated on a clear polyseter base and available in 2050ft 35mm reels. ORWO UN54 (Universal Negative) is a panchromatic, medium speed, ISO 100/21° film coated on a triacetate base and available in 35mm and 16mm format. It can be processed as both black and white negative and using a reversal process. In terms of produceable results, it can most closely be compared to EASTMAN PLUS-X (80 ASA). Pictoriographica spontaneously came into being over Christmas 2017 after founder Jason Lane posted a for sale listing on photrio.org and was inundated with requests to produce more. Pictoriographica offers a standardised set of plate sizes for large format cameras, as well as options for custom dimensions down as far as 18x24mm. Hand-coated on hand-cut glass plates by Jason Lane, Pictoriographica gelatin dry plates can be exposed and developed as either ISO 2/4° or ISO 3/6°. The emulsion is based on early photographic films and sensitive to blue, violet and UV light, meaning it can be handled under a traditional safelight. 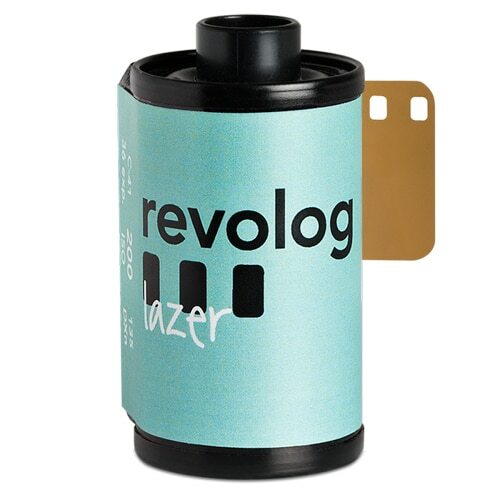 Produced by Kawauso-Shoten, Rera films are available in 127 format rollfilm for use in cameras such as the Primo Jr., Yashica 44, Kodak Brownie Bullet, Baby Rollei, Komaflex, Baby Pearl, Parvola, Walz Automat, Minolta Miniflex, etc. 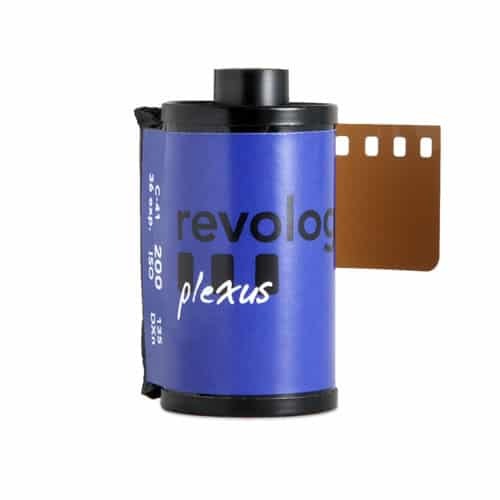 The company recently ceased production of Rerachrome color reversal (slide) film in 2017, although continues to produce its Rera Pan 100 black and white film stock. ReraPan 100 is a hand-cut 127 format, ISO 100/21° colour slide film from Japan. The film can be purchased in single rolls, as well as 3 and 10-pack bundles. Attention: The internal data of table “305” is corrupted! ReraPan 100 is a hand-cut panchromatic 127 format, ISO 100/21° black and white film from Japan. The film can be purchased in single rolls, as well as 3 and 10-pack bundles. Attention: The internal data of table “304” is corrupted! ReraPan 400 is a hand-cut panchromatic 127 format, ISO 400/27° black and white film from Japan. The film can be purchased in single rolls, as well as 3 and 10-pack bundles. Attention: The internal data of table “417” is corrupted! The brainchild of Michael Krebs and Hanna Pribitzer, Revolog produces special effect, handmade films for analog photographic cameras. 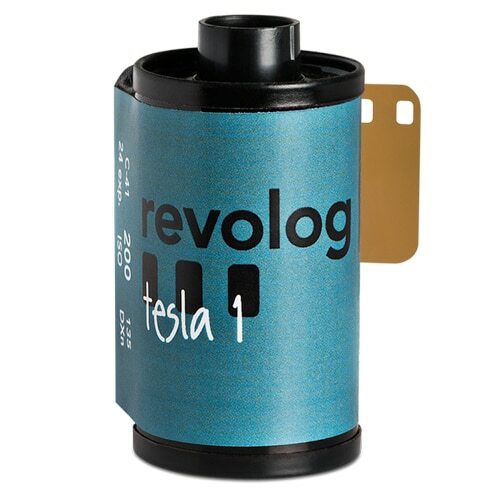 Revolog currently sells thirteen different effect films but is planning to enlarge their stock. 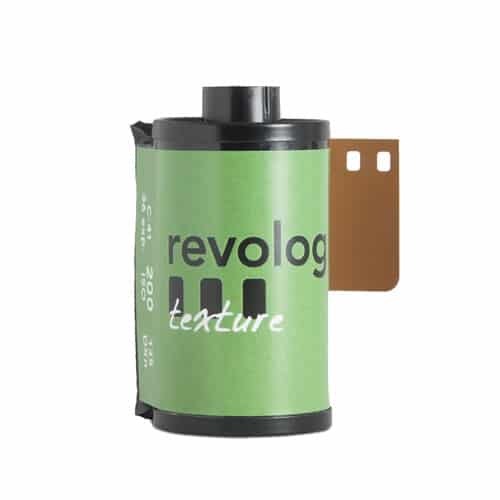 Revolog 460nm is an ISO 200/24° color negative film specially treated to produce a colour-change effect on exposed negatives. Depending on exposure, development and scanning settings, the final photograph will appear blue/violet or yellow/green. Underexposure intensifies the colour, whereas overexposure dampens the effect of the film. The film is available in 36 exposure 35mm format DX-coded cassettes. 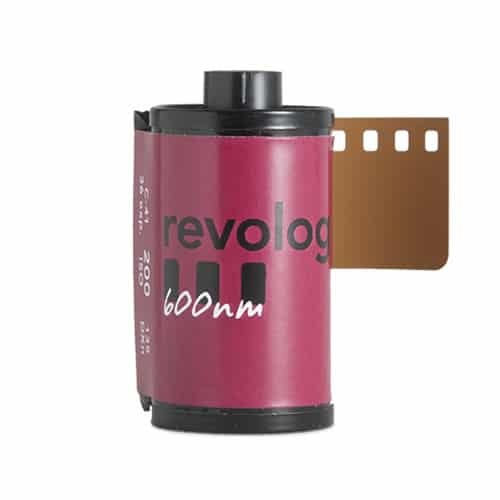 Revolog 600nm is an ISO 200/24° color negative film specially treated to produce a colour-change effect on exposed negatives. Depending on exposure, development and scanning settings, the final photograph will appear with a reddish or blue/green tint. Underexposure intensifies the colour, whereas overexposure dampens the effect of the film. 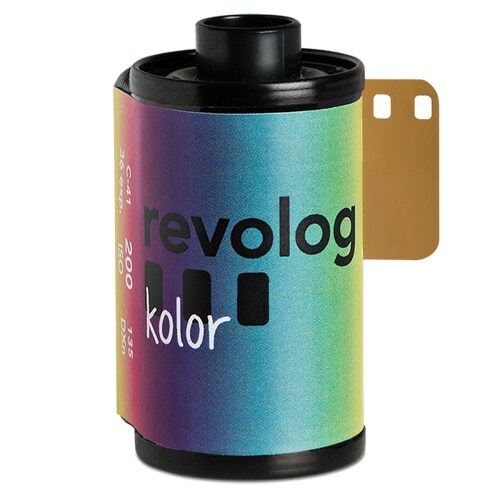 Revolog Kolor is an ISO 200/24° film which adds a rainbow of colours – red, blue, orange, green, pink, turquoise, and more – to your pictures. Colours vary throughout each roll, so different frames will have different hues and gradients, giving your pictures an unexpected pop of colour. Revolog Kosmos is an ISO 200/24° film which adds bright blue spots and streaks to the exposed negative, giving the effect of stars, galaxies and nebulae on the scanned/printed image. The effect is more pronounced on darker areas and is affected by exposure. Lazer film is an ISO 200/24° color negative film which adds green and blue lines to your photographs. The effect covers the sprocket holes and when shot in landscape orientation, the effect will stretch across successive images. Underexposure results in an increased effect. Plexus is an ISO 200/24° film, which covers your photographs in a blue net-like structure similar to underwater reflections. The effect is visible on the whole photograph and is stronger in darker parts of the image. Rasp is an ISO 200/24° film, which includes coloured lines running horizontally across the length of the negative. Like Streak, the effect stretches across successive frames when shot in landscape format. 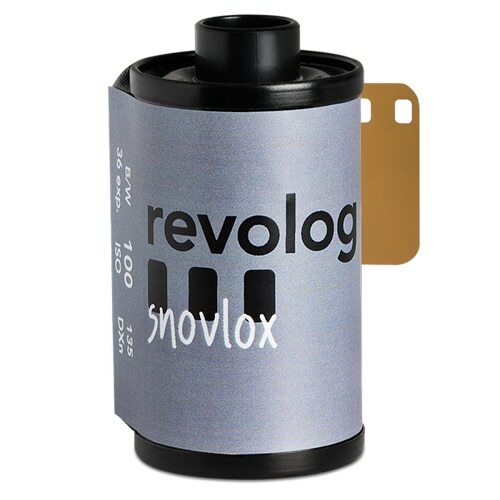 Providing an effect similar in appearance to Volvox, Snovolox is a limited edition ISO 100/21° black and white film available yearly between October to March. 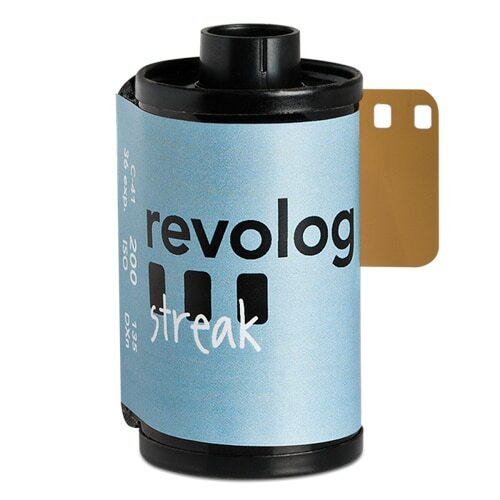 Revolog Streak is an ISO 200/24° film which adds a vintage look to your pictures – as if they were taken through a scratched window or lens. The streak effect is stronger in darker parts of the frame and will add a slightly yellowish tone to these areas of your photo. In brighter or overexposed parts of the negative the effect is almost invisible. 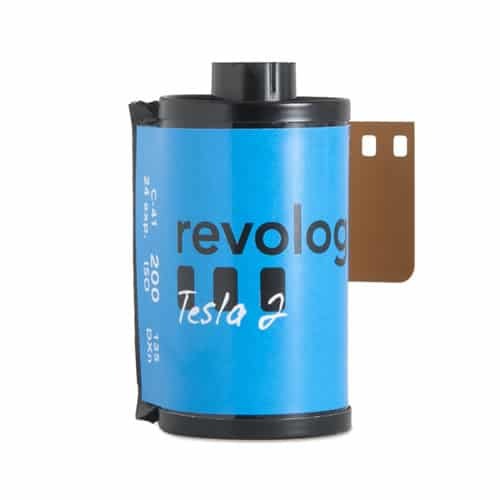 Tesla 1 is an ISO 200/24° film that adds bluish-white lightning bolts to your negatives. The film is available in 36 exposure 35mm format DX-coded cassettes. Revolog Texture shows a repeating bubble-like structure across the entire negative. Because the effect is very prominent in the darker sections of each image it’s important to use proper exposure settings when shooting so that details in underexposed frames may be lost. Texture is great when shooting contrasting forms or architecture, as the effect will almost be invisible in brighter parts of the image while coming through very strongly in darker parts of the picture. Try using it in a photo studio for example with light backdrops or a dark background and bright clothing. 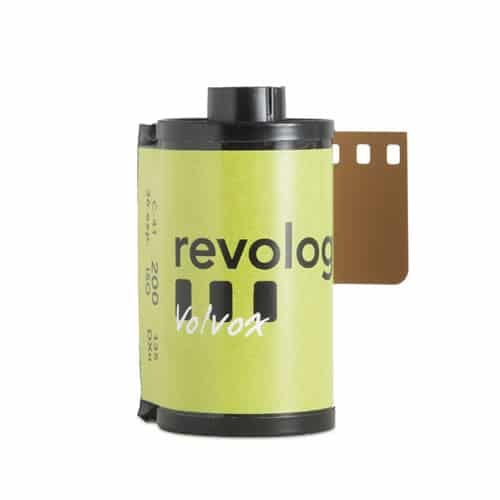 Volvox film features bright green dots of different shapes and sizes all over your negative and like other Revolog films, the effect is more pronounced in darker parts of the image and can give the picture a slight 3D effect. Volvox makes your night shots look like they were taken in a field of glow-worms, gives your party pictures that certain edge they normally lack, and even makes shots of a family dinner suddenly seem extravagant. Rollei films are produced under licence for Macodirect by Agfa and cover a range of very slow technical products (ATO), traditional low, medium and high-speed black and white films, as well as specialist infrared and near-infrared films and colour negative/slide film. Rollei ATO 2.1 is an extremely high-resolution panchromatic black and white film. It has a nominal sensitivity of ISO 32/16°. It’s maximum resolving power of 300 line pairs/mm at a contrast of 1.6:1 (or 900 line pairs/mm at 1000:1) is extremely high. The film is coated on a polyester base with high tear resistance. Is suitable for LE 500 archiving (life expectancy 500 years, as tested by the Rochester Institute of Technology, Rochester, USA). Light a candle – Rollei ATP 1.1 shot at EI 3 (Advanced Technical Pan). Black and white negative film in 120 format shot as 6×6. Rollei ATP 1.1 shot at EI 3 (Advanced Technical Pan). The Rollei CN 200 is a medium-speed unmasked color negative film with a nominal sensitivity of ISO 200/24°. The unmasked nature of the film (no orange layer) creates a unique look: warm, grainy, a little desaturated and is similar in look to older slide films such as Anscochrome 500 and Ferrania 1000D. Maco also suggest that the film is ideal for cross processing in E6 chemistry. 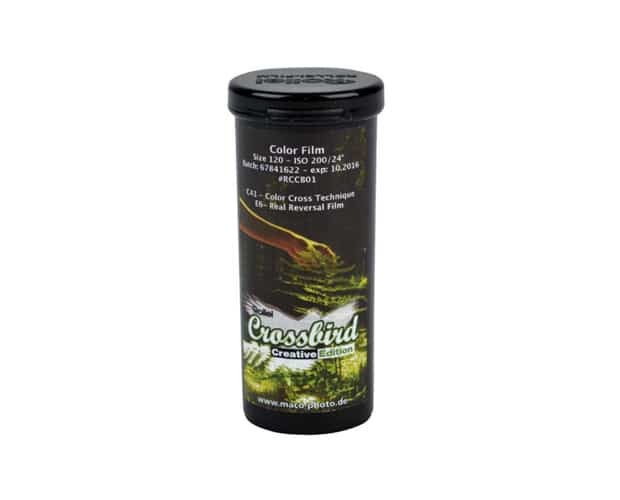 Rollei Crossbird is an ISO 200/24° daylight-balanced color slide film, which provides vivid and bright colors, high saturation, and high contrast when cross processed in C-41 chemistry. The film shows “CR200” on its edge markings – the same as the now-discontinued Rollei CR 200 slide film. Take from that what you will. 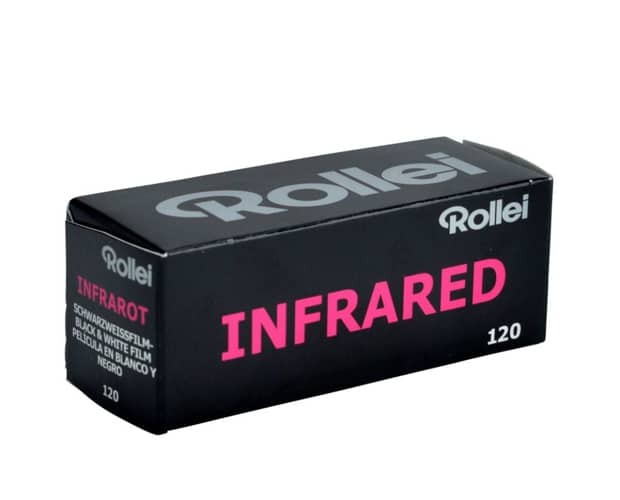 Rollei Infrared is a “hyper”-panchromatic black and white film with a nominal sensitivity of ISO 200/24° – ISO 400/27°. The film features a resolving power of 160 lines pairs/mm at 1000:1 and has a spectral sensitivity up to 820nm, meaning that it can be used as both a traditional black and white film and an infrared film. The film is coated on a transparent polyester base and ideal for black and white reversal processing. Shot on Rollei Infrared 400 at EI 6. Rollei Infrared 400 shot at EI 6. Black and white infrared negative film in 4×5 format. 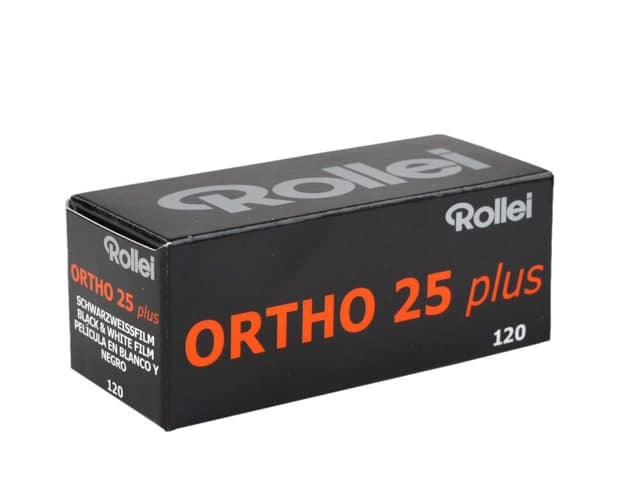 Rollei Ortho 25 is a technical orthochromatic black and white photographic film with a nominal sensitivity of ISO 25/15°. The film is coated on a clear polyester base, making it ideal for black and white reversal processing. 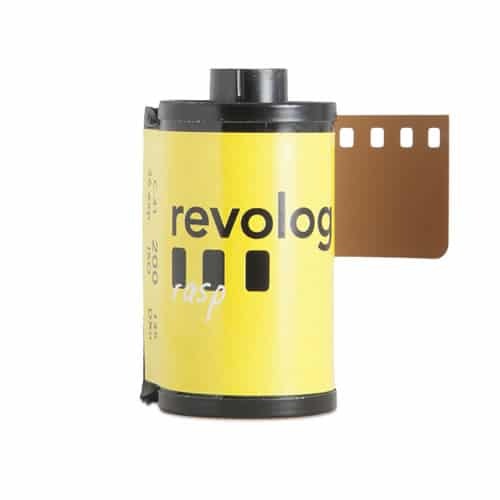 Like Rollei ATO, the film has been rated to meet LE 500 archiving requirements (500 year life expectancy) and has a spectral sensitivity ranging from 380 to 610nm. Rollei Ortho 25 shot at EI 25. 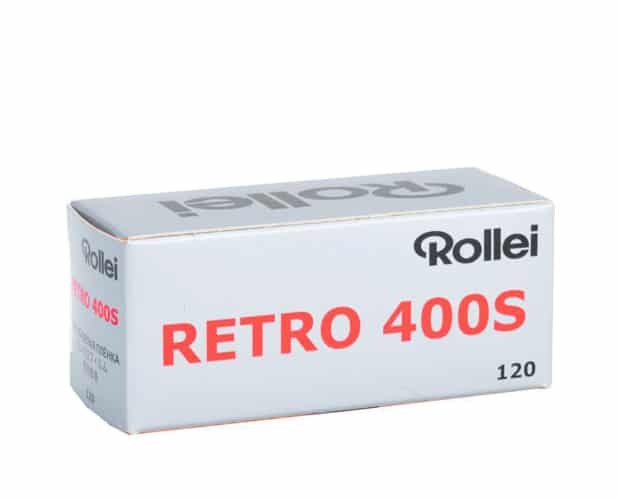 Rollei Retro 400S is a high-speed panchromatic black and white film with a nominal sensitivity of ISO 400/27°. The film provides a red sensitivity of up to 750mn meaning it can be used with a deep red or R72 infrared filter to capture near-infrared photographs. Shot on Maco Eagle AQS 400 (Rollei Retro 400s) at EI 400. 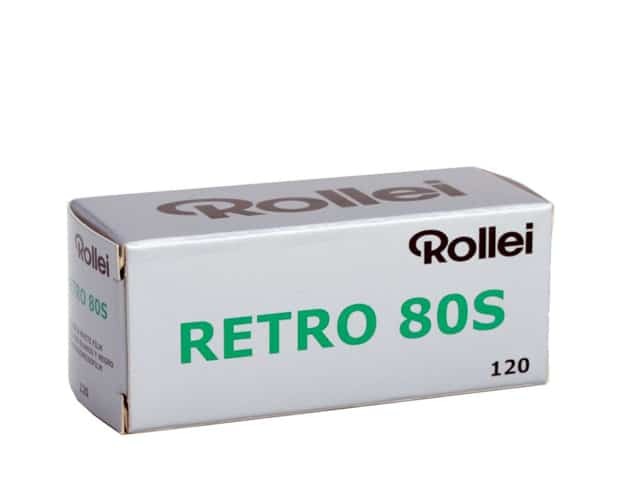 Rollei Retro 80S is a panchromatic black and white film with a nominal sensitivity of ISO 80/20°. Like Rollei Retro 400S, 80S features a extended red sensitivity up to 750mn meaning it can be used with a deep red, or R72 infrared filter to capture near-infrared photographs. The film also features an extended exposure latitude and can be exposed at EI 32 to 100 without altering development times. Shot on Rollei Retro 80S at EI 80. Shot on Rollei Retro 80SBlack and white negative film in 120 format. 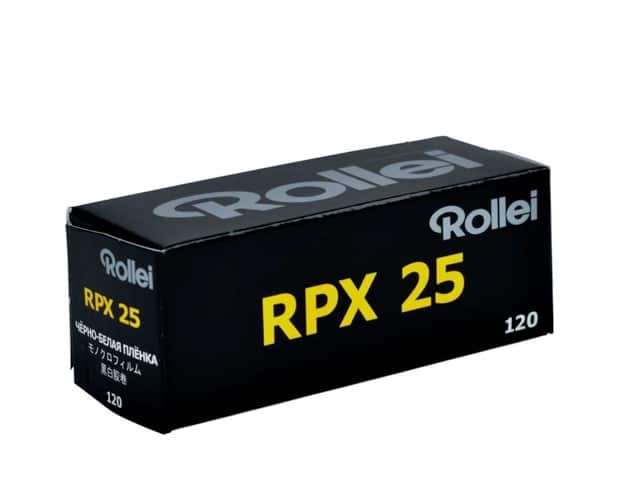 Rollei RPX 25 is a low-speed panchromatic black and white film with a nominal sensitivity of ISO 25/15°. The film features very fine grain for a “normal” black and white film (RMS 8) and very high resolution and contrast: 260 line pairs/mm at 1000:1 contrast. The emulsion is coated onto a transparent polyester base making it ideal for black and white reversal processing. 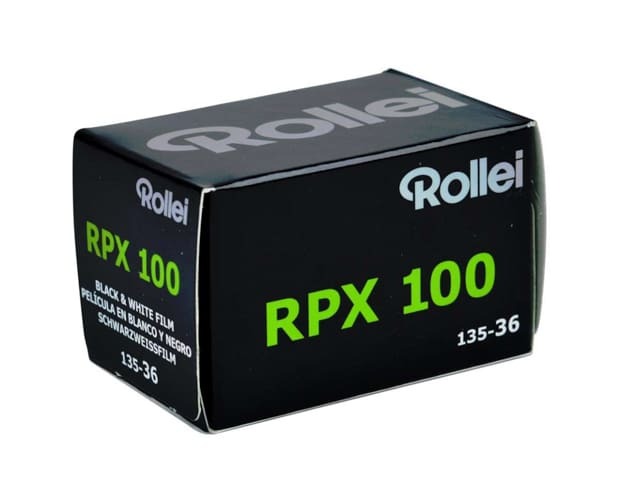 Rollei RPX 100 is a traditional medium-speed panchromatic black and white film with a nominal ISO of 100/21°. The film features a broad exposure latitude, is compatible with most developers and coated onto a polyester base. 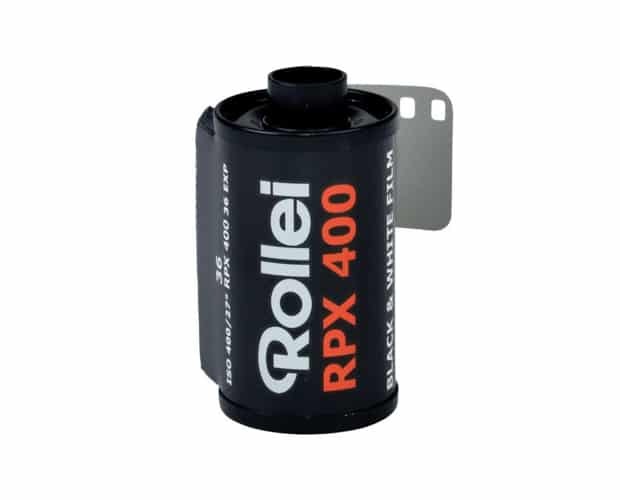 Rollei RPX 400 is a traditional high-speed panchromatic black and white film. This film is ideal for a wide range of photographic and scientific applications. The film features fine grain and excellent exposure latitude and is coated on a polyester base. Nuts to it all – Rollei RPX400 shot at ISO800. Black and white negative film in 120 format shot as 6×6. Fizz (aka “after the rain”) – Rollei RPX 400 shot at ISO400. Black and white negative film in 120 format shot as 6×4.5. 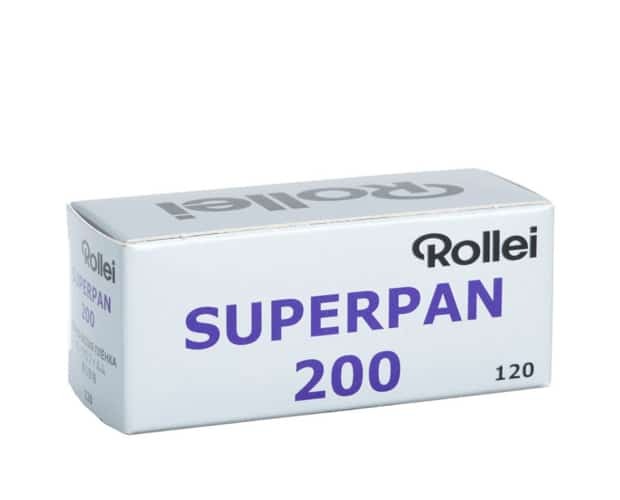 Rollei Superpan 200 is a medium-speed black and white negative film with a nominal sensitivity of ISO 200/24°. The film is ideal for push processing and like Rollei Retro films, is based on the Agfa Aviphot family of emulsions. This means the film features excellent tonal reproduction, an extended red sensitivity and responds well to push processing. The film is ideal for black and white reversal processing and features a resolution of up to 180 line pairs/mm. Read the Rollei Superpan 200 review. Read the Rollei Superpan 200 experimentation guide (including IR samples). Mannequin parade – Rollei Superpan 200 shot at EI 3 with R72 filter. Black and white film in 120 format shot as 6×6. Nearly done, I promise. There are two more parts left to go before we finally round out this series which started back at the beginning of April. Part six is going to be a final listing covering Shanghai to Yodica films, with part seven acting as a complete list of all the films covered on a single page. See you in part six! Removed Rollei CR 200 following receipt of official confirmation of discontinuation. Re-added ReraChrome 100, added ReraPan 400, updated film count.